If you live in Snake Valley, take a look at the list and let me know if you have something you would put on the Top Ten list that I don't have (and what you would take off, since a Top Eleven list just doesn't sound that cool). If you're not from Snake Valley, hopefully the list will help you figure out how to spend your time while you're visiting this sweet part of the world. And if it whets your appetite, I'll soon be posting about how you can really learn a lot more about our desert abode. The illustration above is what's been tested north of Snake Valley, with giant aerostats about three-quarters of a football field long hovering up in the air, tethered to a mobile mooring station. 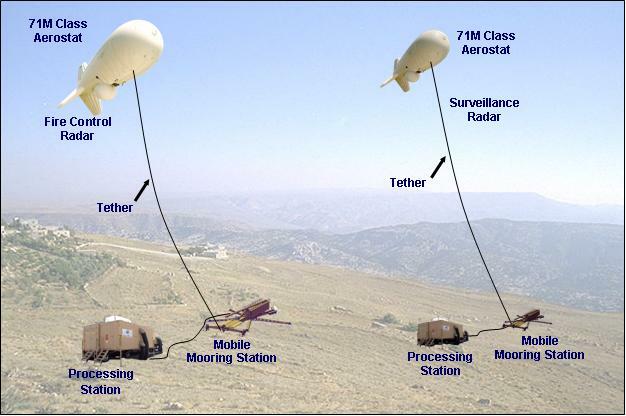 These aerostats are supporting radar to try and detect incoming missiles (or in this case, drones). This is based at Dugway Proving Ground, and has recently been in the press because the FAA denied the launching pad near EskDale and told Dugway they would have to fly the drones south from Dugway into Snake Valley, turn them around, and have them fly back. You can find more in this Millard County Chronicle article. Also, the day after public meetings, the Pentagon released a draft 2013 budget with the curtailment of the JLENS project. It's interesting to read about the JLENS project from a different point of view: the Defense Industry Daily. They include how much money has already been spent on the JLENS project. Ready for some fun this summer and don't want to travel too far? Fortunately, there's lots going on right here in Snake Valley! In addition to Tuesdays at the community center in Baker, Ladies' lunches every other Thursday, jam sessions Friday nights at T&D's, we have some extra events to look forward to. The Great Basin Astronomy Festival will be June 14-16, with over 40 astronomers coming to help lead park visitors into the cosmos via a variety of programs. This astronomy festival keeps getting bigger and better, and is a great opportunity to learn more about what we can see from our fantastic night skies. The Snake Valley Festival will be June 15-17, with a wide variety of events from an ice cream social, wine tasting, breakfast, parade, booths, yard sale, entertainment, silent auction, barbeque dinner, water fight, music, auction, 5K run, children's games, book sale, and much more. The schedules of the two festivals for the third weekend in June are being planned so that attendees will be able to do a lot of activities at each one, so it's a wonderful time to be in Snake Valley. The fourth annual BioBlitz at Great Basin National Park will focus on Diptera-flies. It will be held June 19-21, so extend your stay to learn more about the area. Join entomologists, naturalists, and enthusiasts from all over the U.S. to help find what flies live in the national park. Over the past few years, six fly species new to science have been found. You could possibly find another one! The park is providing free camping to participants during the event. Fourth of July at EskDale is always a great event, with yummy food, entertainment, and fireworks with close-up seating. Want to get an early start that morning? Sign up for the 5k/10k/half marathon! Saturday of Labor Day Weekend, September 1, is the Snake Valley Days Barbeque and Dance. This event has been held since the 1960s and is a great way to reconnect with Snake Valley friends. Snake Valley may not have a lot of residents, but we know how to have fun! Join us for these fun events, and check out the calendar on the side of the Protect Snake Valley blog to keep up to date with what's coming up. If you have events to add, please leave a comment!